With the popularity of USB-C growing and Apple adopting it as the new standard for their laptops, it makes sense to add a USB-C charger to your list of must-have accessories. If you are looking for a compact USB-C charger for your iPhone and iPad, check out the AUKEY USB-C Charger with 18W Power Delivery. Like most of the AUKEY products, the AUKEY USB-C Charger with 18W Power Delivery (Model # PA-Y18) arrived in a small cardboard box wrapped in cellophane. In the box is the AUKEY USB-C Charger with 18W Power Delivery, a User Guide and the usual AUKEY 24-month warranty card. 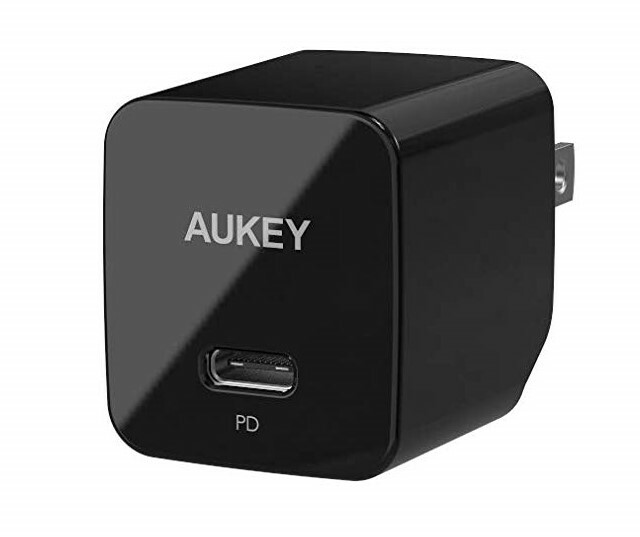 The AUKEY USB-C Charger with 18W Power Delivery is only 1.14” square x 1.25”. There is a single USB-C port on the front and standard US 110V plug on the back side, which folds down when not in use. This makes it much easier to carry, whether in your pocket or purse. That is only slightly larger than the 5W Apple Charger packed with the current iPhone. But since the prongs for the AC outlet doesn’t fold down on the Apple charger, the AUKEY USB-C Charger with 18W Power Delivery winds up being much more compact. The outer shell is made from a hard plastic and has a solid feel to it. But like most AUKEY products, the AUKEY USB-C Charger with 18W Power Delivery is just as tough inside as out. 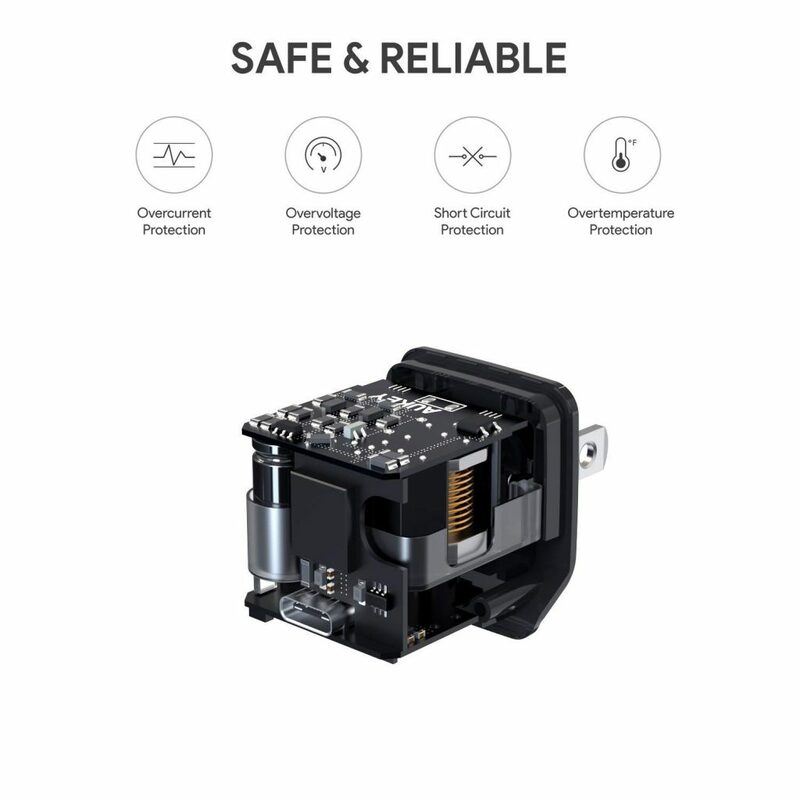 Inside the AUKEY USB-C Charger with 18W Power Delivery is protection from overcurrent, over voltage, over temperature and short circuits. Despite its small size, this one charger can be used to charge both an iPhone and an iPad, eliminating the need to pack multiple chargers. The 18W Power Delivery supports fast charging of compatible Apple products. Here is the current list of the Apple products that support the Fast Charging feature. Like cables, there isn’t much you can test with a charger. Either it works or it doesn’t. In this case, the AUKEY USB-C Charger with 18W Power Delivery worked well. We got a 50% charge of our iPhone XS, in about 30 minutes. We should note that at 18W, this charger isn’t strong enough to recharge a MacBook. We especially like that when plug into a standard 15A wall electrical outlet, the small size of the adapter leaves the other outlet completely accessible. With the prongs folder down, we could easily slip the charger into our pocket. It wasn’t too long ago that we took the position that anything to do with power should only be done with Apple OEM chargers. Since being introduced to several third-party suppliers, we have changed our mind. The AUKEY USB-C Charger with 18W Power Delivery is a perfect example of that. 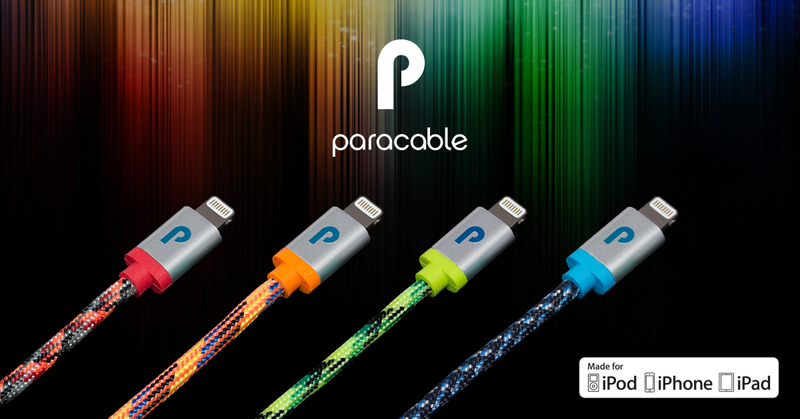 With built-in protection from some of the most common charger issues and a reputation for superior customer service, you can be confident that you are purchasing a top-quality product at a reasonable price. The AUKEY USB-C Charger with 18W Power Delivery is available in either black or white from Amazon and qualifies for free two-day shipping for Prime members. While you’re there, check out some of the other chargers available from AUKEY. We would like to thank the folks at AUKEY for providing the AUKEY USB-C Charger with 18W Power Delivery for our testing and review. What is your favorite charger at home or on-the-go? 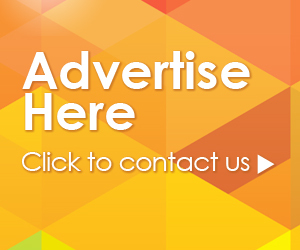 Why not join the conversation and leave a comment below? If you liked this article, please consider sharing it with your friends and leaving a comment below. Also, don’t forget to “Like” us on Facebook, “Follow Us” on Twitter and add the Apple Tech Talk channel to your Apple News app.